PIETRO STEFANONI was born in Lecco on 17 April 1963. In 1979 he was given a snare drum and a hi-hat as a present and began his adventure in music. He began his musical studies in Lecco with Mario Sacchi, and then moved on to Milan and the “Nuova Accademia di Musica Moderna”, where between 1981 and 1987 he studied with Italian drum hero Tullio De Piscopo, who chose him as his assistant. Pietro’s collaboration with De Piscopo continues to this day. While studying in Milan, he also attended workshops Elvin Johnes, Peter Erskine and Gunter “baby” Sommer, with whom in 1984 he formed Crams Percussion Staff, with other four percussionists. The ensemble is known today simply as Percussion Staff and is still performing and touring extensively (www.percussionstaff.com), as it has done since 1985, in theatres, jazz clubs and festivals in major European cities including Berlin, Hamburg (“Der Fabrik” broadcast on TV by NDR), Stuttgart, Dresden, Leipzig, Magdeburg, Konstanz, Mulhouse, Le Mans and many more. In 1989 he won the drum seat in national TV channel Canale 5’s in-house orchestra, taking part in the programme “Finalmente è Venerdì” during which, among others, he backed Gloria Gaynor. In 1990 he embarked on his first extensive tour with Maurizio Vandelli (formerly of Equipe 84). Also in 1990 he recorded all the drum tracks on PFM guitarist Franco Mussida’s debut album, “La tenda Rossa” (Virgin). In 1992 he became part of the teaching faculty at “Laboratorio Musicale” (www.laboratoriomusicale.com), a musical association and school. His extremely functional teaching method is widely appreciated and his drum and percussion classes are attended every year by over sixty students. In 1993 he developed an interest in flamenco and began collaborating with guitarist Livio Gianola. Together they formed the band “la cumbre” and performed in a host of jazz club, theatres and festivals. Pietro also took part in the shooting of an instructional video by Spanish dancer and choreographer Antonio Canales (published in Italy by Fabbri), and took part in the productions of dancer and choreographer Mara Terzi, the most recent of which, “Carmen”, was performed in major Italian theatres and went on in 1999 to tour Japan, visiting the country’s most prestigious concert halls, including the Bunkakajakan in Tokyo, the Royal Festival Hall in Osaka, the Keimin Kajakan in Niigata. Ever since 1994, Pietro has been Toto Cutugno’s live drummer of choice, on the artist’s tours of Italy, Europe, Russia and all the ex-Soviet republics, United States, Canada and Australia. He has repeatedly appeared on Italian national TV, on all the major channels: RAI 1 – 2 – 3, Mediaset networks, Telemontecarlo, RTSI (Italian Swiss TV), NDR (National German TV), POL1 (Poland), and more. 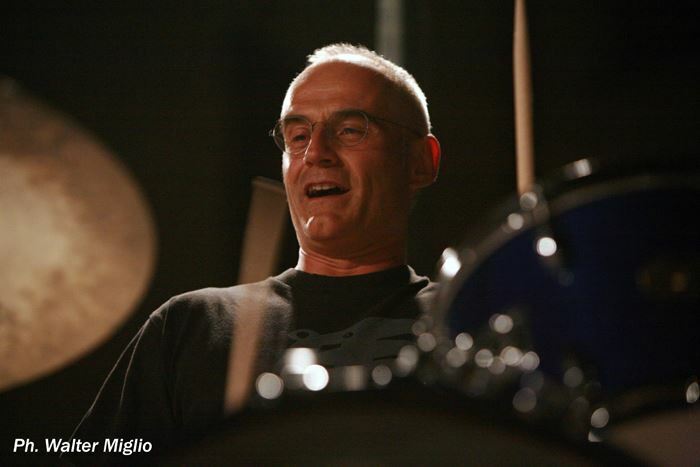 In 2001 he laid down the drum parts for Livio Gianola’s first solo CD, “Sombra”, and drum and percussion tracks for gospel choir “Sol Quair”’s debut CD, also penning the arrangements for the majority of the tracks. In 2002 he took part in the recording of the “Missa Criolla” CD with the “Santa Cecilia” choral academy, again working also as arranger. The same year he recorded percussion tracks for cover band Blind Trust’s CD “Acoustic”. In 2003 Pietro was back on the road with Toto Cutugno, in Italy during the summer and around the world subsequently, making stops in Montecarlo, Moscow (twice), Tallin , Almaty (twice), Atlantic City and Los Angeles, where he performed two nights in a row at the Kodak Theatre in Hollywood. With Percussion Staff he recorded a new CD called “Nix But” and performed in major festivals in Italy, including once again the Clusone Jazz Festival. He also recorded with Livio Gianola on his latest CD, due for release early in 2004. His plans for 2004 include continuing his teaching recording and performing activities and also hold and co-ordinate drum workshops at Laboratorio Musicale’s new school in Lecco, with the participation of leading Italian and international drummers.